For other uses, see Karbala (disambiguation). "Kerbela" redirects here. For the moth genus, see Kerbela (moth). Karbala (Arabic: كَرْبَلَاء‎, translit. 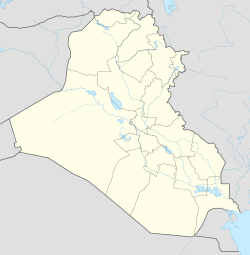 Karbalā’, Persian: کربلاء‎), also Kerbala, is a city in central Iraq, located about 100 km (62 mi) southwest of Baghdad, and a few dozen miles east of Lake Milh. Karbala is the capital of Karbala Governorate, and has an estimated population of 700,000 people (2015). The city, best known as the location of the Battle of Karbala in 680 CE, or the Mosques of Imam Husayn and Abbas, is considered a holy city for Shi'ite Muslims in the same way as Mecca, Medina and Jerusalem. Tens of millions of Shi'ite Muslims visit the site twice a year, rivaling Mecca as a place of pilgrimage. The martyrdom of Husayn ibn Ali is commemorated annually by millions of Shi'ites. Up to 8 million pilgrims visit the city to observe ‘Āshūrā’ (the tenth day of the month of Muharram), which marks the anniversary of Husayn's death, but the main event is the Arba‘īn (the 40th day after Ashura), where up to 30 million visit the holy graves. Most of the pilgrims travel on foot from all around Iraq and more than 56 countries. There are many opinions among different investigators, as to the origin of the word "Karbala". Some have pointed out that "Karbala" has a connection to the "Karbalato" language, while others attempt to derive the meaning of word "Karbala" by analyzing its spelling and language. They conclude that it originates from the Arabic word "Kar Babel" which was a group of ancient Babylonian villages that included Nainawa, Al-Ghadiriyya, Karbella (Karb Illu. as in Arba Illu [Arbil]), Al-Nawaweess, and Al-Heer. This last name is today known as Al-Hair and is where Husayn ibn Ali's grave is located. The investigator Yaqut al-Hamawy had pointed out that the meaning of "Karbala" could have several explanations, one of which is that the place where Husayn ibn Ali was martyred is made of soft earth—"Al-Karbalat". According to Shi'ite belief, the archangel Gabriel narrated the true meaning of the name Karbalā’ to Muhammad: a combination of karb (Arabic: كَرْب‎, the land which will cause many agonies) and balā’ (Arabic: بَلَاء‎, afflictions)." Karbala experiences a semi-arid climate with extremely hot, dry summers and cool winters. Almost all of the yearly precipitation is received between November and April, though no month is truly wet. Destruction of the Tomb of Husain at Karbala on the orders of Caliph al-Mutawakkil. The Battle of Karbala was fought on the bare deserts on the way to Kufa on October 10, 680 (10 Muharram 61 AH). Both Husayn ibn Ali and his brother Abbas ibn Ali were buried by the local Banī Asad tribe, at what later became known as the Mashhad Al-Husayn. The battle itself occurred as a result of Husain's refusal of Yazid I's demand for allegiance to his caliphate. The Kufan governor, Ubaydallah ibn Ziyad, sent thirty thousand horsemen against Husayn as he traveled to Kufa. The horsemen, under 'Umar ibn Sa'd, were ordered to deny Husayn and his followers water in order to force Husayn to agree to give an oath of allegiance. On the 9th of Muharram, Husayn refused, and asked to be given the night to pray. On 10 Muharram, Husayn ibn Ali prayed the morning prayer and led his troops into battle along with his brother Abbas. Many of Husayn's followers, including all of his present sons Ali Akbar, Ali Asghar (six months old) and his nephews Qassim, Aun and Muhammad were killed. In 63 AH (682 ), Yazid ibn Mu'awiya released the surviving members of Husayn's family from prison. On their way to the Mecca, they stopped at the site of the battle. There is record of Sulayman ibn Surad going on pilgrimage to the site as early as 65 AH (685 CE). The city began as a tomb and shrine to Husayn and grew as a city in order to meet the needs of pilgrims. The city and tombs were greatly expanded by successive Muslim rulers, but suffered repeated destruction from attacking armies. The original shrine was destroyed by the Abbasid Caliph Al-Mutawakkil in 850 but was rebuilt in its present form around 979, only to be partly destroyed by fire in 1086 and rebuilt yet again. Like Najaf, the city suffered from severe water shortages that were only resolved in the early 18th century by building a dam at the head of the Husayniyya Canal. In 1737, the city replaced Isfahan in Iran as the main centre of Shia scholarship. In the mid-eighteenth century it was dominated by the dean of scholarship, Yusuf Al Bahrani, a key proponent of the Akhbari tradition of Shia thought, until his death in 1772, after which the more state-centric Usuli school became more influential. The Wahhabi sack of Karbala occurred in 21 April 1802 (1216 Hijri) (1801), under the rule of Abdul-Aziz bin Muhammad the second ruler of the First Saudi State, when 12,000 Wahhabi Muslims from Najd attacked the city of Karbala. The attack was coincident with the anniversary of Ghadir Khum event, or 10 Muharram. This fight left 3,000–5,000 deaths and the dome of the tomb of Husayn ibn Ali, grandson of Muhammad and son of Ali bin Abi Talib, was destroyed. The fight lasted for 8 hours. After the First Saudi State invasion, the city enjoyed semi-autonomy during Ottoman rule, governed by a group of gangs and mafia variously allied with members of the 'ulama. In order to reassert their authority, the Ottoman army laid siege to the city. On January 13, 1843 Ottoman troops entered the city. Many of the city leaders fled leaving defense of the city largely to tradespeople. About 3,000 Arabs were killed in the city, and another 2,000 outside the walls (this represented about 15% of the city's normal population). The Turks lost 400 men. This prompted many students and scholars to move to Najaf, which became the main Shia religious centre. Between 1850 and 1903, Karbala enjoyed a generous influx of money through the Oudh Bequest. The Shia-ruled Indian Province of Awadh, known by the British as Oudh, had always sent money and pilgrims to the holy city. The Oudh money, 10 million rupees, originated in 1825 from the Awadh Nawab Ghazi-ud-Din Haider. One third was to go to his wives, and the other two thirds went to holy cities of Karbala and Najaf. When his wives died in 1850, the money piled up with interest in the hands of the British East India Company. The EIC sent the money to Karbala and Najaf per the wives' wishes, in the hopes of influencing the Ulama in Britain's favor. This effort to curry favor is generally considered to have been a failure. On April 14, 2007, a car bomb exploded about 600 ft (180 m) from the shrine, killing 47 and wounding over 150. On January 19, 2008, 2 million Iraqi Shia pilgrims marched through Karbala city, Iraq to commemorate Ashura. 20,000 Iraqi troops and police guarded the event amid tensions due to clashes between Iraqi troops and Shia which left 263 people dead (in Basra and Nasiriya). A map of Mesopotamia in the 3rd millennium BCE, showing Nineveh (the township of Yunus)), Qattara (or Karana), Dūr-Katlimmu, Assur, Arrapha, Terqa, Nuzi, Mari, Eshnunna, Dur-Kurigalzu, Der, Sippar, Babylon, Kish, Susa, Borsippa, Nippur, Isin, Uruk, Larsa and Ur, from north to south. Note the relative proximity of Babylon and Sippar to Lake Milh, which is near Karbala. Some Shi'ites consider this verse of the Quran to refer to Iraq, land of the Shi'ite sacred sites of Kufah, Najaf, Karbala, Kadhimiyyah[a] and Samarra, since the Monotheistic preachers Ibrāhīm (Abraham) and Lūṭ (Lot), who are regarded as Prophets in Islam, are believed to have lived in the ancient Iraqi city of Ur, before going to The Blessed Land". But we delivered him (Ibrahim) and Lut (from their Polytheistic opponents), and directed them to the land which we have blessed for the Worlds. Aside from the story of Abraham and Lot in Polytheistic Mesopotamia, there are passages in the Quran about Mount Judi, Babil and Qaryat Yunus ("Town of Jonah"). "Karbala, where your grandson and his family will be killed, is the most blessed and sacred land on Earth, and it is one of the valleys of Paradise." "God chose the land of Karbala as a safe and blessed sanctuary, twenty-four thousand years before He created the land of the Ka'bah and chose it as a sanctuary. Verily it [Karbala] will shine among the gardens of Paradise, like a shining star shines among the stars for the people of Earth." "Not one night passes in which Gabriel and Michael do not go to visit him [Husayn]." It is narrated from Ja'far that: "The earth of the pure and holy grave of Husayn ibn ‘Ali (a.s) is a pure and blessed musk. For those who consume it, it is a cure for every ailment, and if our enemy uses it then he will melt the way fat melts, when you intend to consume that pure earth recite the following supplication"
The famous quote: "Every day is Ashura, every land is Karbala." Karbalaa FC is a football club based in Karbala. There are many references in books in films to "Karbala", generally referring to Husayn's death at the Battle of Karbala. Husayn is often depicted on a white horse impaled by arrows. There are films and documentaries about the events of Karbala in both animated and realistic form (see external links "Karbala: When the Skies Wept Blood"; "Safar-e-Karbala"). Video footage of the actual city exists in a British documentary entitled "Saddam's Killing Fields." The documentary shows the March 1991 destruction of the city by Saddam's army through the video camera of two brothers who lived in the city. Hawza are the Islamic education institutions that are run collectively by mujtahid or Allamas to teach Shia Muslims and guide them through the rigorous journey of becoming and Alim. In terms of the hawaz in Karbala, After the death of a renowned Alama, the Sayyid Muhammad, the leadership in terms of teacher shifted to taqlid to mujtahid. This was a significant factor that lead to the leadership of Ulama to reside in Karbala and as well as Najaf. Initially Karbala's hawza (Islamic education institution) consisted mostly of Iranians and Turkish Ulama. After the death of Sharif-ul-Ulama Mazandarani in 1830 and the repression of the shia population by the Ottomans in 1843 both played an important role in the relocation of many Ulamas and thus Najaf becoming the center of Shia Islamic leadership in education. As of now, there are two universities in Karbala. University of Karbala, which was inaugurated on March 1, 2002, is one of the top most universities in Iraq regarding academic administration, human resources, and scientific research. The Ahlulbait International University was founded in September 2003 by Dr. Mohsen Saleh Mohammed Baqir al-Qazwini. The university has three major focuses: Faculty of Law, Arts, and Islamic Law. Other majors of education such as medicine, agriculture, informatics etc. are still in the developing stages. Warith al-Anbiya University in Karbala, has recently been established under a project of Husayn Holy Shrine, having the faculties of engineering, administration, economics, law and pathology, which is ready to receive students for the first academic year 2017–2018. In the Indian subcontinent, Karbala, apart from meaning the city of Karbala (which is usually referred to as Karbala-e-Mualla meaning Karbala the exalted), also means local grounds where commemorative processions end and/or ta'zīya are buried during Ashura or Arba'een, usually such grounds will have shabeeh (copy) of Rauza or some other structures. In South Asia where ta'zīya refer to specifically to the miniature mausoleums used in processions held in Muharram. It all started from the fact that the great distance of India from Karbala prevented Indian Shi'is being buried near the tomb of Husayn or making frequent pilgrimages (ziyarat) to the tomb. This is the reason why Indian Shi'is established local karbalas on the subcontinent by bringing soil from Karbala and sprinkling it on lots designated as future cemeteries. Once the karbalas were established on the subcontinent, the next step was to bring Husayn's tomb-shrine to India. This was established by building replicas of Husayn's mausoleum called ta'zīya to be carried in Muharram processions. Thousands of ta'zīyas in various shapes and sizes are made every year for the months of mourning of Muharram and Safar; and are carried in processions and may be buried at the end of Ashura or Arbain. ^ "Iraq: Governorates, Regions & Major Cities - Population Statistics in Maps and Charts". ^ a b "Iraq: Livelihoods at risk as level of Lake Razaza falls". IRIN News. 5 March 2008. Retrieved 25 November 2015. ^ a b Under Fire: Untold Stories from the Front Line of the Iraq War. Reuters Prentice Hall. January 2004. p. 15. ISBN 978-0-13-142397-8. ^ Shimoni & Levine, 1974, p. 160. ^ Aghaie, 2004, pp. 10-11. ^ Malise Ruthven (2006). Islam in the World. Oxford University Press. p. 180. ISBN 9780195305036. ^ David Seddon (11 Jan 2013). Political and Economic Dictionary of the Middle East. Karbala (Kerbala): Routledge. ISBN 9781135355616. ^ John Azumah; Dr. Kwame Bediako (Contributor) (26 May 2009). My Neighbour's Faith: Islam Explained for African Christians. Main Divisions and Movements Within Islam: Zondervan. ISBN 9780310574620. ^ Paul Grieve (2006). A Brief Guide to Islam: History, Faith and Politics: The Complete Introduction. Carroll and Graf Publishers. p. 212. ISBN 9780786718047. ^ Paul Grieve (2006). A Brief Guide to Islam: History, Faith and Politics : the Complete Introduction. Carroll and Graf Publishers. p. 212. ISBN 9780786718047. ^ "Interactive Maps: Sunni & Shia: The Worlds of Islam". PBS. Retrieved June 9, 2007. ^ "Walking Freedom: Iraq home of largest rally against terror in the world". RT. Retrieved November 20, 2016. ^ a b al-Qummi, Ja'far ibn Qūlawayh (2008). Kāmil al-Ziyārāt. Translated by Sayyid Mohsen al-Husaini al-Mīlāni. Shiabooks.ca Press. p. 545. ^ "World Weather Information Service – Karbala". United Nations. Retrieved 1 January 2011. ^ Staff writers. "The Saud Family and Wahhabi Islam, 1500-1818". www.au.af.mil. Retrieved 8 August 2016. ^ Martin, Richard C., ed. (2003). Encyclopedia of Islam and the Muslim world ([Online-Ausg.] ed.). New York: Macmillan Reference USA. ISBN 0-02-865603-2. OCLC 52178942. ^ Litvak, Meir (2010). "KARBALA". Iranica Online. ^ a b Khatab, Sayed. Understanding Islamic Fundamentalism: The Theological and Ideological Basis of Al-Qa'ida's Political Tactics. Oxford University Press. ISBN 978-977-416-499-6. Retrieved 11 August 2016. ^ Vassiliev, Alexei. The History of Saudi Arabia. Saqi. ISBN 978-0-86356-779-7. Retrieved 9 August 2016. ^ Cole, Juan R.I. and Moojan Momen. 1986. "Mafia, Mob and Shiism in Iraq: The Rebellion of Ottoman Karbala 1824-1843." Past & Present. No 112: 112-143. ^ Cole, Juan R. I. Sacred Space and Holy War: The Politics, Culture and History of Shi'ite Islam. London: I.B. Tauris, 2002. ^ Hamourtziadou, Lily (2007-04-15). "'A Week in Iraq'". iraqbodycount.org. Archived from the original on 2007-04-29. Retrieved 2007-04-15. ^ "Iraqi Shia pilgrims mark holy day". 19 January 2008 – via bbc.co.uk. ^ "Iraq's holy cities enjoy boom in religious tourism". Al Arabiya. 4 April 2013. ^ منارة موجدة «مَعلَمٌ حددت وظيفته تسميته». Al-Shirazi. Retrieved January 5, 2018. ^ الآثار منارة موجدة. Holy Karbala. Retrieved January 5, 2018. ^ "$500 MILLION AIRPORT SCANDAL EXPOSES INDUSTRIAL SCALE CORRUPTION IN HOLY KARBALA". Foreign Relations Bureau - Iraq. 2017-03-07. Retrieved 2018-11-21. ^ "Karbala Northeast (Imam Hussein) Airport". CAPA Centre for Aviation. Retrieved 2018-11-20. ^ MEED. 42. Economic East Economic Digest. 2018. pp. 38–48. ^ a b "Three Day Fast of Nineveh". Syrian orthodox Church. Archived from the original on 2012-10-25. Retrieved 1 February 2012. ^ Tabatabaei, Sayyid Mohammad Hosayn (1979). Shi'ite Islam. Suny Press. p. 192. ISBN 978-0-87395-272-9. ^ al-Qummi, Ja'far ibn Qūlawayh (2008). Kāmil al-Ziyārāt. Translated by Sayyid Mohsen al-Husaini al-Mīlāni. Shiabooks.ca Press. pp. 66–67. ^ "Kadhimiya". Encyclopaedia of Iranian Architectural History (in Persian). Archived from the original on 3 October 2015. ^ "History of the Shrine of Imam Ali al-Naqi & Imam Hasan Al-Askari, Peace Be Upon Them". Al-Islam.org. Archived from the original on 23 February 2006. Retrieved 23 February 2006. ^ Wheeler, Brannon M. (2002). Prophets in the Quran: an introduction to the Quran and Muslim exegesis. Comparative Islamic studies. Continuum International Publishing Group. pp. 1–393. ISBN 978-0-8264-4957-3. ^ Morris Jastrow, Ira Maurice Price, Marcus Jastrow, Louis Ginzberg, and Duncan B. MacDonald; "Babel, Tower of", Jewish Encyclopedia; Funk & Wagnalls, 1906. ^ al-Qummi, Ja'far ibn Qūlawayh (2008). "Addendum before chapter 89". Kāmil al-Ziyārāt. Translated by Sayyid Mohsen al-Husaini al-Mīlāni. Shiabooks.ca Press. p. 545. ^ al-Qummi, Ja'far ibn Qūlawayh (2008). "88". Kāmil al-Ziyārāt. Translated by Sayyid Mohsen al-Husaini al-Mīlāni. Shiabooks.ca Press. p. 534. ^ al-Qummi, Ja'far ibn Qūlawayh (2008). "88". Kāmil al-Ziyārāt. Translated by Sayyid Mohsen al-Husaini al-Milani. Shiabooks.ca Press. p. 536. ^ al-Qummi, Ja'far ibn Qūlawayh (2008). Kāmil al-Ziyārāt. Translated by Sayyid Mohsen al-Husaini al-Mīlāni. Shiabooks.ca Press. p. 534. ^ Litvak, Meir (1998). Shi'i Scholars of Nineteenth Century: The Ulama of Najaf and Karbala. United Kingdom: Cambridge University Press. pp. 51–141. ISBN 0-521-62356-1. ^ "Karbala University: A General View". University of Karbala. Archived from the original on 2017-10-10. Retrieved 2017-04-21. ^ "Founder of University". University of Ahlulbait. Archived from the original on 2012-08-27. Retrieved 2017-04-21. ^ Ali Tekmaji (September 20, 2017). "Karbala opens new advanced academic university". Imam Hussein Holy Shrine (International Media). Retrieved September 23, 2017. ^ A citation from Fruzzetti, "Muslim Rituals," for this use of Karbala is as follows: "The Muslims then proceed to 'Karbala' to bury the flowers which were used to decorate the tazziyas, the tazziyas themselves being kept for the next year's celebration." (pp. 108-109). ^ Behrens-Abouseif, Doris; Vernoit, Stephen. Islamic Art in the 19th Century: Tradition, Innovation, And Eclecticism. BRILL. ISBN 9004144420. Retrieved 12 August 2016. C. Edmund Bosworth, ed. (2007). "Karbala". Historic Cities of the Islamic World. Leiden: Koninklijke Brill. This page was last edited on 30 March 2019, at 12:22 (UTC).